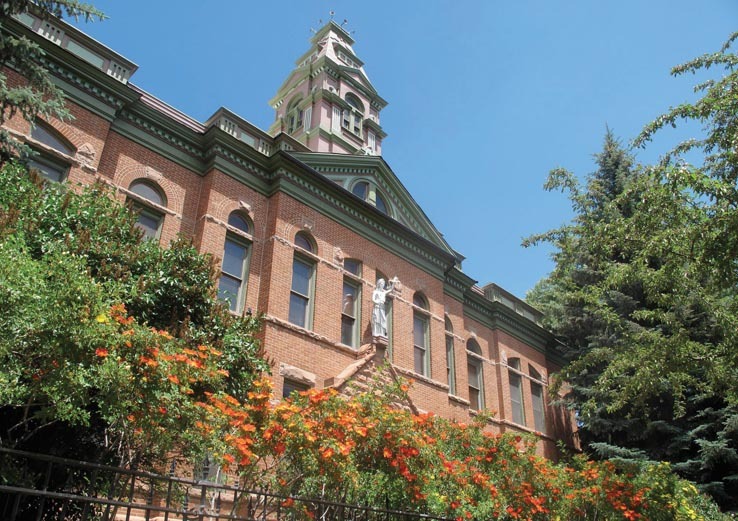 ASPEN – Installing a sprinkler system in the historic Pitkin County Courthouse is among the priorities in a 10-year, $5.4 million schedule of maintenance, repairs and upgrades to county government buildings. Aspen’s fire marshal identified the need for a fire-suppression system in the stately old building several years ago, according to Jodi Smith, county facilities manager. The building houses local courts and various offices. Given its age (it was constructed in 1890), the work must be done carefully and with an eye to its historic integrity. “I’ve been looking around at the Hotel Jerome and other historic places to see how they’re doing it,” Smith said. The upgrade, which has yet to be engineered – or authorized by county commissioners – will cost an estimated $420,000, according to an audit of 14 county buildings, prepared by consulting firm Facilities Engineering Associates. The audit report, detailing the need for improvements and repairs to various structures, was presented to commissioners on Tuesday. The last audit was done in 2002 and resulted in expenditures that averaged $500,000 per year in upkeep of facilities over the ensuing decade. The new audit identifies about $1 million worth of projects in the first year of the next decade’s worth of efforts, and about $5.4 million in expenditures over the next 10-year span. It would average out to about $575,000 a year, commissioners were told. Add in separate expenditures identified by the county, including equipment replacement, and a series of energy efficiency projects identified in a separate study, and the county is looking at $3.1 million in costs in the first year and $7.9 million over 10 years, according to the audit report. In addition, there are road projects, expenditures on the county’s vehicle fleet and technology needs to factor in, Smith said. A 10-year capital plan that prioritizes projects will be the next step, said Jon Peacock, county manager. The immediate repairs identified by auditors relate to fire/safety issues and structural repairs to prevent water from leaking into buildings. A smoke-detection system in the Plaza building, adjacent to the old courthouse, and a fire alarm system in the recycling building at the landfill are also recommended. The latter structure contains a lot of combustible materials, noted Les Zumbrunnen, Denver office manager for Facilities Engineering Associates. “If the place goes up, there’s no way to tell you it’s on fire until you see the smoke,” he told commissioners. Over the next 10 years, other repairs to the old courthouse include restoration of the historic windows and doors, and work on interior finishes. Boiler replacement is a near-term priority. Commissioner Rachel Richards suggested the county look into the cost of stripping and refinishing what appears to be original wood trim inside the buildin; it has been painted over the years. “I feel like we’ve really degraded some of the historic interior of the building,” she said. Overall, the audit report concluded county buildings are in good to fair shape for their ages, and generally well maintained, with limited instances of deferred maintenance.